We had a patient present this week that underscored the advantage of NeoGraft (no linear scar) versus a strip procedure (linear scar) for patients seeking hair rejuvenation. This is a 31-year-old gentleman who had a strip procedure twice. He developed a very wide linear scar that he is very self-conscious about. In an attempt to improve the scar, he underwent a scar revision with no significant improvement. Micro-pigmentation also offered no benefit. He remains quite disturbed by the appearance of the scar which restricts him in terms of how he wishes to have his hair cut. He is now more concerned about the scar than he is about his hair loss. Our plan is to help! 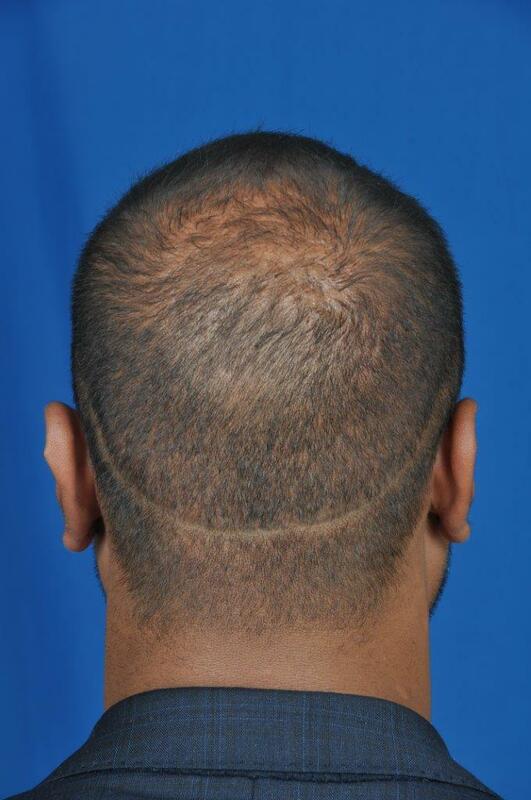 During a NeoGraft procedure, we will transplant hair into the scar to eliminate the visibility of the scar. Additionally, we will be grafting into the crown for further improvement of his balding areas. NeoGraft is an advanced hair transplant technology that uses the Follicular Unit Extraction (F.U.E.) method. F.U.E is a minimally-invasive procedure that removes individual follicles from the back of the head or “donor area.” The follicle groupings are then individually transplanted in the recipient’s thinning area. What are the benefits of NeoGraft (F.U.E.) vs. other methods? If you are experiencing hair loss and unsure if you are a candidate for NeoGraft in Denver, contact us to schedule a free consultation with Dr. Broadway or Dr. Cisco. These top Denver-area plastic surgeons and hair transplant specialists will help you to determine which treatment may be best for you. Call 303.680.8989 or email info@broadwaymd.com.